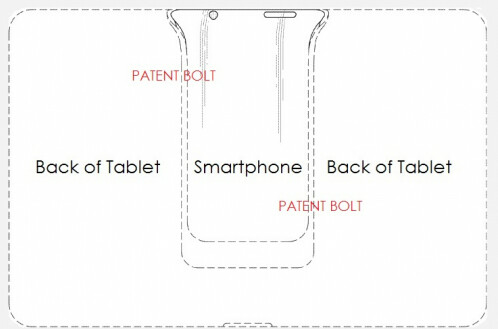 Based on a patent received by Samsung, it looks like the Korean manufacturer is ready to take on ASUS in the niche market for phones that dock to power a tablet. One difference between the ASUS Padfone and the device in the Samsung patent filing is in the shape of the product. The ASUS Padfone is a standalone smartphone that connects to a dock on a screen to turn that screen into a tablet. Samsung's device doesn't resemble a smartphone as much as the sides broaden out toward the top of the device to form the letter "T". With this design, Samsung is able to allow its smartphone to be more easily dockable with the receptacle on the back of its tablet/screen. The design makes it look like the slate is a stand-alone tablet and only the user will know that it is actually being powered by a smartphone. Originally filled in the first quarter of 2012 in Korea and the following quarter in the U.S., Samsung was awarded patent D685,774 for "Terminal for wireless communication". Will Samsung challenge ASUS with a smartphone that can dock to a screen to power a tablet? It certainly seems that way. Considering the recent speculation that Samsung, like Apple, has lost its mojo, it could be that Samsung is hoping that something like this will boost sales. Samsung the "Copy King", at it again... The way this patent looks, Asus is definitely next in line to sue when Apple is done, with Samsung. I think the Galaxy S is the only phone from their Galaxy S series that is a copy of the iPhone. The rest of the Galaxy S series look nothing like iPhones except being a rectangle with rounded corners and having a touchscreen. But I don't think there should be a patent on this. Its like a car company making a van first, then other companies not being able to make vans. Then their shouldn't be a patent for rectangulars either. Then their shouldn't be a patent for rectangles either. Only some people are mad at Samsung. look at apple they copy n steal too but still got away with it. 9/10 Apple patents fall in same category ... copy from others modify a bit and call it their own. 1/1 of your number is made up. Now this is really too much, they might not be trying to sue Asus for their existing products, but prevent them from making future products with such concepts. Samsung is becoming like Apple. And many companies, not just Apple, have already accused Samsung of stealing. yes your right, it should have been HTC, Sony or LG that did this because its only copying if samsung does it right? Haven't you noticed that ever since Samsung made phablets, every other company is doing it to? Samsung also made samsung minis of their flagship phones, and now other companies are doing it to? Also why would you care if a company copies another company? Dont you want the best features on your phone? If a company adds all the best features from all other companies and put it on 1 phone, id buy it in a heartbeat, i couldn't care less if it was copied or not unless I work for those companies. Well said jason2k13.....recently there has been a influx in Samsung haters and I fail to see why? Someone explain to me with a VALID reason why people hate Samsung! Too true my brother... Some are just commenting for the sake of it! Samsung copying or not, we (consumers) are winning at the end of the day! Well then I guess everyone is copying Motorola (first cell phone) then. And in case you didn't remember, the Dell streak was a major flop, it sold about as well as the BB Playbook. So why wouldn't another company try and take a concept that was poorly executed and see if they can't make it work, which judging by their sales they have done. Lastly, calling out companies for copying is ridiculous, unless their product is an exact clone of the original. The whole point of competition is to offer a similar device that improves upon the original. If you're going to call out Samsung for copying, then you'd have to call all but the first company to offer: cars, computers, TVs, cola drinks, stereos, microwaves, and the list goes on and on. Basically any product made by more than one company. Don't have an exynos and am not really loyal to any company. What I said however was true. Motorola was the first in cell phones, and the Dell Streak was a flop, sorry. When all of you people wail about "copying" you sound like a 5 year old on the playground complaining to the teacher. Copying to an extent is a fact of business. Let's take the auto industry for example. Components like air conditioning, anti lock brakes, power locks and windows, and power steering all work essentially the same. So that means that one company put them in their cars, and others copied them. What I'd like to know is why are you people so angry about it? Do you work for someone that Samsung copied from? What stake do you have in this? The thing is we know none of what's happeining except what we read in the news. Perhaps they did copy Dell, maybe they were planning something like the Note that far back and halted it when the Streak tanked. You don't know, and I don't know. Why get so worked up about this? Damn.... why are you so stupid PLEASE READ ALL MY COMMENT!!! can you find something about COPYING? please stop being a clueless, mindless, and closed minded fanboy!!! so are you saying we should start talking about who invented what now? Because we might aswell talk about motorola and talk about history again and that every phone should not be made because they are all copy cats which is boring, now lets talk about who popularized 'what' first shall well? Wasn't my point in the first place was for people to not worry who copies who because its the costumer who wins it all. maybe you should check what you said in comment # 13, especially this sentence. "Haven't you noticed that ever since Samsung made phablets, every other company is doing it to? Samsung also made samsung minis of their flagship phones, and now other companies are doing it to?" because what you say in that sentence, is a mistake and a big lie. What actually happened was .... since Dell made ​​the first android phablet, samsung and other companies trying to make a better phablet. as well as with the "mini". "if I'm not mistaken" since Sony (SE) ​​made ​​the first mini android flagship, samsung and other companies trying to do the same. I'm sure if you were not closed minded and mindless fanboy you will be able to admit your mistakes, and stop saying nonsense. Ok, I am reading yours and Jason's comments again, and you know what, he's right. When talking about the phablets, he never said they invented them, only that since Samsung started making them others have jumped on the bandwagon. Besides Dell, who was making phablets until the Note came out? The Streak tanked and Samsung picked up the ball and ran with it. As far as the mini versions of phones, again he did not say Samsung invented them either, only that after they started making mini versions of their flagships that others are following suit, which is true. Now go ahead, respond and call me stupid and a fanboys, etc, etc. Apparently you can't have a conversation without name calling and antagonizing. I don't know everything, but I know that. Maybe you should realize that as well, you might learn something new. Let me tell why you so stupid because you just like other clueless samsung fanboy always OFF TOPIC, Jason says “EVER SINCE SAMSUNG MADE PHABLET EVERY OTHER COMPANY DOING IT TO” i just prove it that everything what he have said is “wrong” Cuz Dell is the one who make the first android phablet and since then every other company like acer, samsung, pantech,and LG start/follow to made android phablet, and go to wikipedia if you want to know more about phablet. also the same situation is happen with mini’s. if i’m not wrong ever since Sony(SE) made mini android flagship samsung and other company doing it to. i just prove it that everything jason have said about EVER SINCE is totaly wrong, if you want reply my comment please stay on topic!!! I'm not normally one to stoop to the level of name calling and being insulting.. but WOW.. Yudi, you have got to be one of the most narrow minded and blatantly STUPID people that I have ever encountered on these forums. It's been explained to you several times what Jason was trying to say - that since Samsung started making the Phablets and flagship minis, other manufacturers have jumped onboard. What is so F-n hard to understand about that statement? You argue that Jason is saying Samsung invented the mini or phablet. NO, he never said that. Samsung made the phablet and mini POPULAR. They were NOT first to do it. Samsung took a chance and SUCCEEDED where Dell failed with the phablet. Can you dispute that FACT? No, you can't. 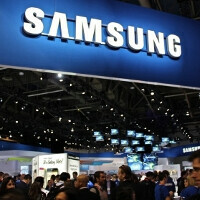 Because of Samsung's success, other manufactures have been scrambling to get in on Samsung's success. NOT A DIFFICULT CONCEPT to grasp Yudi. Same deal with the Mini. Quit calling people Stupid Yudi, because you are the one coming across as a total moron with ZERO ability to comprehend what you are reading. Neither phonearena nor Androidauthority nor Gsmarena nor anyone can interpret or Knows what similarities and differences this patent in connection with Asus..if this really punch a very the same approach as what Asus is doing then all of you can continue talking BS abt "copysung"
How about cursing Apple first?